Want to experience unreleased Windows 10 features? Here’s what you need to know to become a Windows 10 Insider. Becoming Windows 10 Insider used to be a major hassle, reserved only for Microsoft’s biggest fans and most dedicated developers. 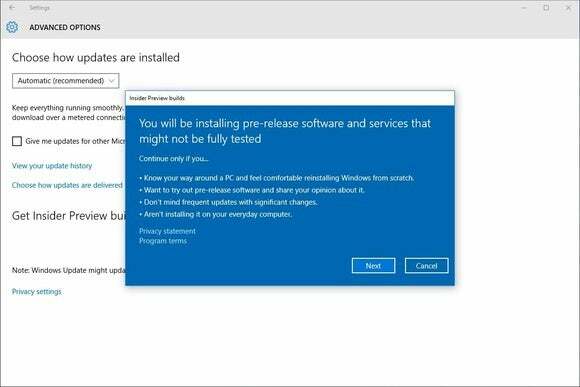 But with the official launch of Windows 10, getting into Microsoft’s preview program and sampling pre-release features is now a much simpler process. 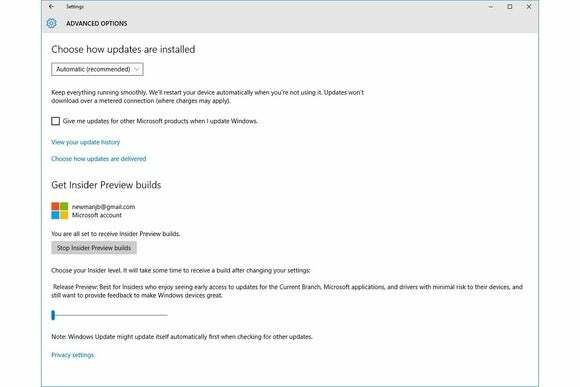 If you’ve been curious about Windows 10 Insider builds, but are wondering where to start, look no further. Here’s what you need to know about the program, and how to join when ready. To become a Windows 10 Insider, all you need is a Microsoft account and a PC running Windows 10. Of course, you can upgrade to Windows 10 for free provided you’re running Windows 7 or Windows 8.1 on a PC that meets Microsoft’s system requirements, but reverting to these operating systems from the preview becomes a bigger ordeal. You’ll want to create recovery media (for Windows 7) or a USB recovery key (for Windows 8) before getting started. Assuming you’re running Windows 10, you should first create a restore point that you can go back to if things go wrong. And no matter what operating system you’re on, it’s a good idea to back up any important data before you take the plunge. Worst case scenario, you may have to reinstall Windows from scratch. A few more disclaimers, coming straight from Microsoft: Only join the preview program if you don’t mind lots of updates and sudden changes, are comfortable with troubleshooting, can handle backing up and restoring an operating system, and know what an ISO is and how to use it. Microsoft also recommends only installing the preview on a PC that isn’t your daily driver. Realistically, we’re all just playing a bit of CYA here. 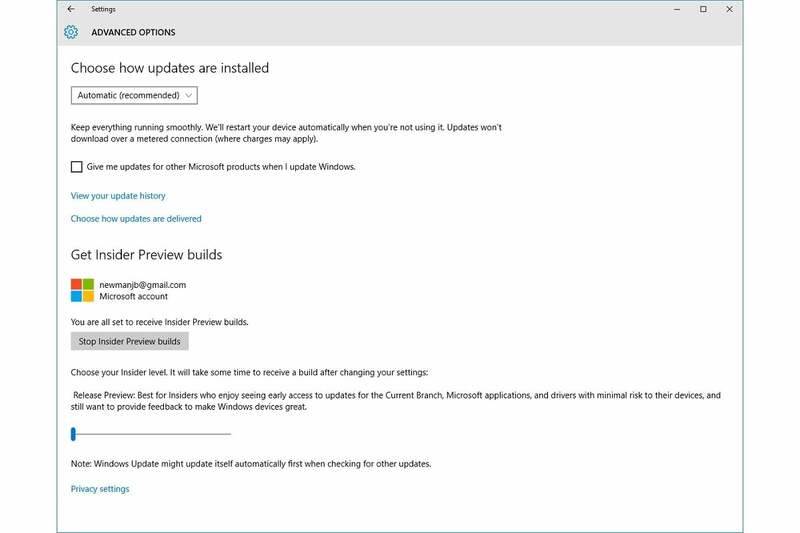 Windows 10 insider builds shouldn’t wreak much havoc on your PC, especially for the more stable preview options that Microsoft offers (more on that shortly), and switching back to the main version Windows 10 is pretty easy. But as always, it pays to be prepared. One last warning: If you haven’t backed up your important files, now’s the time. In Windows 10, open the Settings app, click Update & Security, then Windows Update, then select Advanced Options. 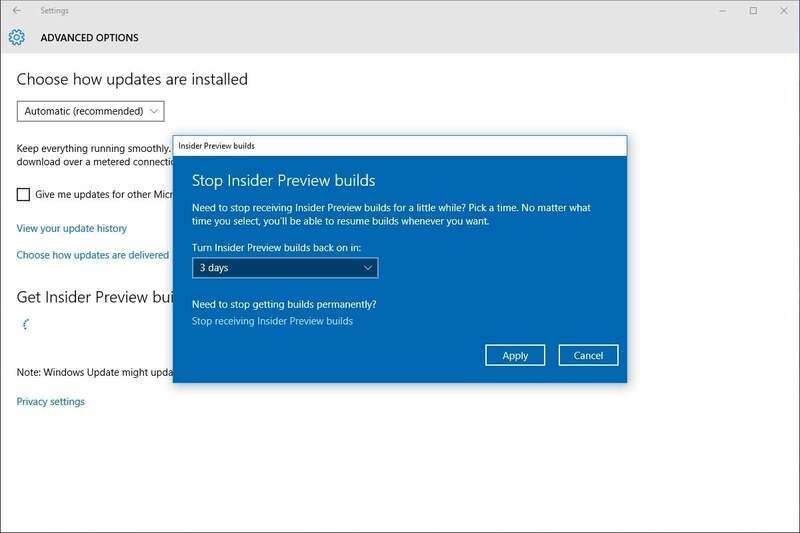 Under the Get Insider Preview builds section, select Get started. Observe Microsoft’s final attempts at frightening disclaimers, which we’ve covered above. Release Preview: Best for Insiders who enjoy seeing early access to updates for the Current Branch, Microsoft applications, and drivers with minimal risk to their devices, and still want to make Windows devices great. Slow: Best for Insiders who enjoy seeing preview builds with minimal risk to their devices, and still want to provide feedback to make Windows devices great. Fast: Best for Insiders who enjoy being the first to identify issues, provide suggestions, and ideas to make Windows devices great. Note that by default, you’re signed up for Release Preview, but you can switch rings at any time. 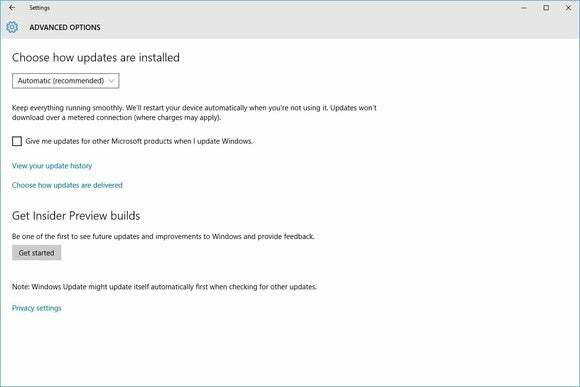 Just head to the Windows Update menu in Windows Settings, select Advanced Options, and adjust the slider near the bottom of the screen. A pop-up window will appear, with an option to turn Insider Preview builds back on in one, three, or five days. Alternatively, you can click “Stop receiving Insider Preview builds” to remain on the main version of Windows indefinitely. As Microsoft itself warns, this method may not work in all cases, which is why it’s a good idea to set a restore point beforehand. If all else fails, you can reinstall Windows 10 from scratch, and hopefully transfer all the precious you dutifully backed up earlier.